There have been a lot of stories in the news lately about men hitting women. This is obviously domestic violence. It is obviously abuse. But not all abuse is as easy to identify. Fists leave physical damage, but words and other actions leave psychological damage that takes much longer to heal. Maybe you’re married to a guy who freely admits he’s arrogant and self-centered. A narcissist. Maybe you’re convinced he thinks men are superior to women even though he’s never used those exact words. Maybe he told you he “just doesn’t like women” once and it’s haunted you ever since. Even since then you’ve wondered, “What does that say about me? Does that mean he doesn’t like me? Does that mean he doesn’t respect me?” You think, “I can’t possibly be the only exception to his statement.” You never asked flat out, but that conversation made you realize that he would never see you as his equal. And somehow, at the time, you accepted it. Maybe you’re married to a guy who finds little ways to make you feel like you’re not worthy of his love or respect. You don’t think he’s doing it deliberately or consciously, but that doesn’t make it any easier to brush off. Even if you can dismiss 99% of his subtle insults, that last 1% slowly builds up, day after day, until you’re completely crushed under the weight of the chides, tsks, and sighs. Until one day you wake up and discover that you believe him. You’re not worthy of his love. You’re not worthy of having a partner who doesn’t expect you to walk one step behind him. When it all boils down to it, you realize that you’re scared on him. Not because he hits you or verbally assaults you, but because he looks down on you. You’re his inferior. And you know that whatever you do, inevitably to try and please him, will more than likely fail. On some level, at least. For one detail or another he’ll look at you like you’re an idiot and you’ll curse yourself for screwing up yet again. You’ll berate yourself for not living up to his standards, even though the rational part of your brain knows that’s impossible. And after each incident you’ll be even more scared of messing up the next time. You’re afraid of his disappointment, his explanation of what you did wrong, and his lack of appreciation for all of your efforts. This is emotional abuse. Plain and simple. It’s not as obvious as physical violence or outright insults, but it’s just as damaging. Eleven years ago today we went on our first date. Five years ago today we said “I do.” Our marriage isn’t always perfect, but it’s always fun. Here’s to many, many more years with my wonderful husband. Happy anniversary, Dan! Dan and I don’t exactly have a relationship that breaks a lot of norms, but today we corformed to gender stereotypes even more than usual. Dan cleaned his gun while I made cookies! Ten years ago today we went on our first date. Four years ago today we became husband and wife. And what an amazing journey it’s been so far! Here’s to another decade of our lives together. Happy anniversary, Dan. I love you! 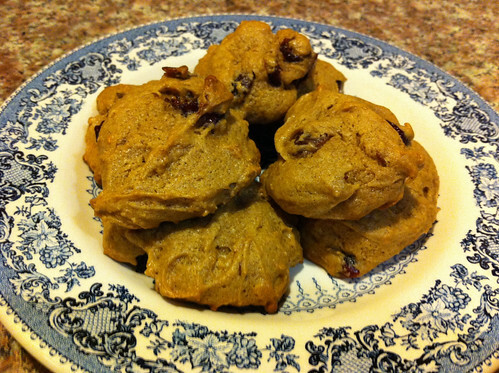 This year’s wedding cake reincarnation – spice, orange, and cranberry cake cookies. Tomorrow, on our actual anniversary, I will top them with some homemade orange cream cheese frosting to make them as similar to our wedding cake as possible. I can’t wait! Have you ever had a moment in your life feel like it was pointing toward your destiny, either at the time or when you looked at it in retrospect? It was a little more than ten years ago – late May 2001. It was the first day of my second Boeing internship, but I was unable to start the job I was hired for because my security clearance hadn’t come through yet. I was originally hired for an internship on the Delta rocket program in Huntington Beach, but funding for that position fell through so I was placed on a program in Seal Beach instead. Unfortunately that meant that my clearance paperwork wasn’t submitted early enough for it to be ready when I arrived in California. So for the time being I was stuck in limbo, killing time in an unclassified area until I got cleared. Despite this difficulty, I was told that one of my new co-workers would be stopping by at some point during my first day to talk to me about my assignment for the next seven months. I didn’t know when he would arrive, so while I was waiting I started getting my computer account, password, paycheck direct deposit, etc. set up on the unclassified side. It was a painful process and I needed help from one of the office administrators. I went over to her desk to ask about something (I can’t for the life of me remember what anymore) and then I headed back to my temporary desk. I was oblivious to my surroundings so when turned a corner a little too quickly I ran smack into someone. He was tall with thick dark hair and a radiant smile. I don’t remember if I apologized for running into him, but I know I smiled back. I couldn’t help it. When I looked into his eyes I experienced that struck-by-lightning moment that every girl waits her whole life for. I was absolutely stunned. After standing there staring at each other for a few seconds the gorgeous man and I went our separate ways. I was overwhelmed with emotions as I started to walk away when suddenly the office administrator called me back to her desk. Mister tall, dark, and handsome was standing there which made my heart skip a few beats. Turns out that the guy I ran into was my new co-worker who had come by to introduce himself and his name was Dan Feller. I didn’t know it yet, but I had just met my future husband and it was love at first sight – for both of us. Five years ago Dan asked me to marry him. It was actually December 29, 2005, five years and one day ago, but I didn’t remember in time to post this yesterday. 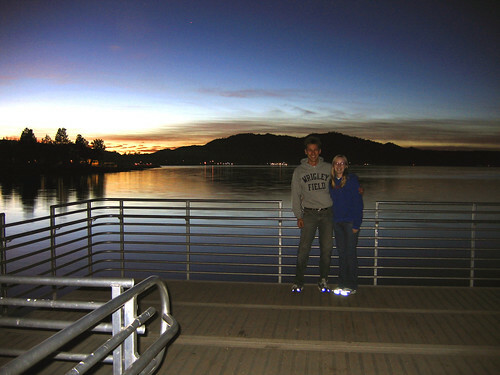 That day we drove up to Big Bear for a few days of snowboarding, but when we arrived in town Dan insisted that we stop at a park on the lake to get a picture of the quickly-fading sunset. Little did I know that he had something else in mind as well! The photo above was taken just before Dan proposed. It was a moment that I’ll never forget. These past five years have been quite the whirlwind, but we’ve made it through together so far. I love you, Dan, and I hope the years just get better and better.